For the U.S. 101 bridges, see Confusion Hill Bridges. 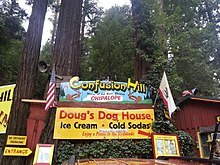 Confusion Hill is a roadside attraction in Piercy, California. The attraction, which opened in 1949, includes what is dubbed as a "gravity house," a structure built to give the interior visitors tilt-induced optical illusions, similar to the perspective on a gravity hill. Occupants experience the need to stand upright when they actually already are. Also included in the attraction is the Mountain Train Ride a 1½ mile, 20 in (508 mm) narrow gauge built in a switchback layout along the side of a steep hill. For 60 years, Confusion Hill was on the heavily traveled US 101 highway, also known as the Redwood Highway. Due to repeated mudslides obstructing the road, US 101 was realigned in 2009 to the Confusion Hill Bridges, bypassing the attraction. In 2010 Confusion Hill was granted California Points of Historical Interest status. In 2016, Alex Hirsch, creator of the television series Gravity Falls, installed a statue of series villain Bill Cipher at Confusion Hill, after it was removed from its initial home of Reedsport, Oregon. ^ Anderson, Glenda (January 29, 2010). "Confusion Hill gains historical interest status". The Press Democrat. 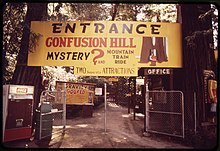 Wikimedia Commons has media related to Confusion Hill.